The accuracy of reaching hard-to-access spots is higher than using regular toothbrushes. You don’t have to contort your face (to reach your wisdom teeth) any longer while brushing. Since different features like speed, efficiency, and accuracy are involved in removing food and plague, electric toothbrushes help greatly in getting rid of bad breath and food smells from your mouth. Electric brushes have special features for sensitive gums, sensitive teeth, gum massage, and whitening. Some electric toothbrushes have added features like sensors that let you know if you have to replace the brush-heads, or if you’re applying too much pressure. Many electric toothbrushes have built-in timers that help you brush for the correct amount of time. They even emit a beep when the 2 minute time is up! Electronic toothbrushes are fantastic for people with medical conditions like arthritis, manual dexterity issues, or Parkinson’s (where motor control is extremely difficult and regular brushing can harm the mouth rather than clean it). Since these brushes have larger handles and do not need a vigorous movement to clean your teeth and gums, they are easier to grip and keep steady. Regularly using an electric toothbrush ensures fewer visits to the dentist and fewer oral health concerns. This helps you save enormous amounts of money in the long term. Kids can now brush their teeth on their own and you can rest assured that the electric toothbrush is doing its job well! What are the different types of electric toothbrushes available in the market today? Before we start with the different types of toothbrushes, you must remember that electronic toothbrushes are different from battery-operated ones. Electronic toothbrushes are rechargeable ones that connect to a wall socket or USB to charge. You keep the handle of the electronic toothbrush but change the brush heads every 3 – 4 months. Battery-operated ones use AA size batteries and vibrate a little. They are not as efficient in actually cleaning your teeth. There are two types of electric toothbrushes available today. These are sonic and oscillating. They each come with different operating features but give a superiorly clean and healthy feel to your teeth. Let us look at each in brief. Sonic toothbrushes successfully disrupt dental plaque by not only emulating the normal action of a toothbrush but also in places beyond the tips of the brush. Sonic electronic toothbrushes in full-power can go as high as 32,000 brush strokes a minute and vibrate from side to side at high frequencies. Mechanical scrubbing action of this toothbrush is based on amplitude (distance covered, upwards and downwards strokes) and the number of strokes. The fluid dynamics of the brush work in using fluids like saliva and water to systematically break down plaque to a higher degree than normal ones. This fluid mechanism of sonic toothbrushes can also equate to the term ‘non-contact’ plaque breakdown and works more efficiently than regular oral hygiene methods. 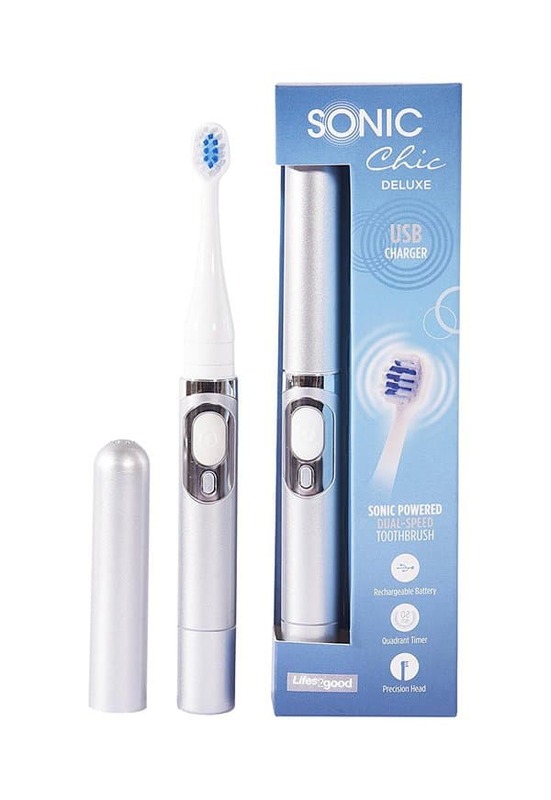 Some notable features of the sonic electronic toothbrushes are UV brushes that sanitize the teeth as they break down plaque, different types of batteries, travel accessories, Bluetooth and smartphone apps for updates, pressure indicators, quadrant timers, and replacement features. Unlike Sonic toothbrushes that vibrate from one side to the other, Oscillating toothbrushes spin around the tooth, in one direction or the other. Oscillating toothbrushes can go up to 8000 brushstrokes per minute and are easier for many people to handle in comparison to the sonic toothbrushes. Oscillating brushes perform the same action that sonic brushes do, but without the ultrasound frequency and speed of sonic toothbrushes. The back and forth motion of the oscillating toothbrush is a more comfortable factor since it covers the entire tooth and rotates in one direction. One area where oscillating toothbrushes are better than sonic ones is that they don’t cause as much of a splash in the mouth as sonic ones do. Sonic toothbrushes splash a lot of fluid around the mouth (fluidic motion) as they break the plaque down. What should you be looking for in electronic toothbrushes? Style: When selecting an electronic toothbrush, always pick one that feels most comfortable on your teeth. Some people get irritated with sonic brushes due to the high speeds and fluid displacement, while some do not like the slower action of the oscillating ones. Special Features: Some electric toothbrushes offer special features like Bluetooth pairing with an App on your smartphone and facial recognition that help notify you of the areas in your mouth that you might have missed while brushing. This special feature will help improve your brushing habits while tracking your real-time brushing. Another notable feature to look out for is USB charging instead of only the wall charging feature. You can now charge your electronic toothbrush with your laptop or phone USB plug while you sleep or work. Durability: Durability is of importance when investing in an electronic toothbrush. There are already additional costs associated with replacing brush heads every 3 – 4 months. Ensure that the model you choose is a durable one that gets you the best results. 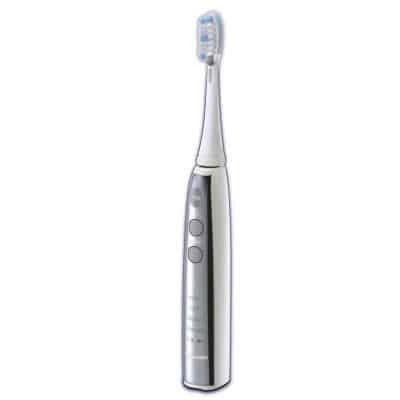 The Sonic Chic Deluxe is a low range, practical sonic toothbrush with metallic finishes. This model is a lightweight and inexpensive one that comes with USB charging and an extra brush head. The design is elegant and comes with a clip lid that doesn’t break easily. It flashes after 30 seconds and switches off automatically after 2 minutes to stop over-brushing. 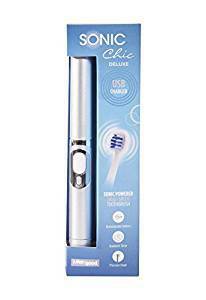 The Sonic Chic Deluxe is a perfect electronic toothbrush for travel and daily use and can be successfully used to introduce the daily electronic brush habit over a manual toothbrush. It is marketed for young adults, but can easily be used by all ages. Kids can also be introduced to this model over time and with supervision. The only drawback to this model would be that it is difficult to distinguish the difference between the 2 modes of speed. 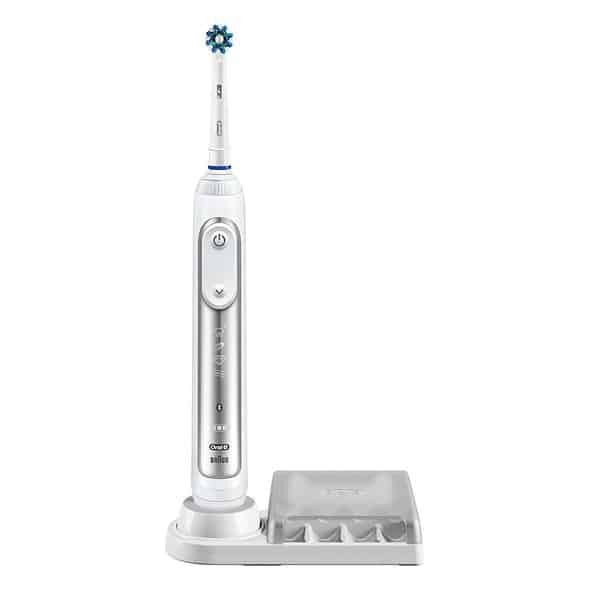 The Sterline Sonic is a low range affordable electronic toothbrush that comes with 31,000 brushstrokes per minute. This model is a compact unit that comes with 2 replaceable heads so that you do not immediately have to invest in new brush heads. Made especially for sensitive gums and teeth, the Sterline Sonic comes in three brushing modes – Clean for everyday brushing, Soft for sensitive gums and teeth, and Massage to stimulate gums and improve oral health and hygiene. With 2 inbuilt timers; Automatic to shut off the brush after 2 minutes and the 30-second Interval timer to evenly clean all four quadrants of your teeth, the Sterline Sonic electronic toothbrush offers advanced cleaning properties and helps prevent bad breath, plaque, and tartar buildup. As an added bonus, it also has a 2 years manufacturer’s guarantee with an extra-long charging life and 2 complimentary brush heads. The Philips Sonicare for kids is ideal for children aged 4 to 10 years. This low range toothbrush helps in encouraging kids to brush their teeth and promote oral hygiene in a fun way with sounds to indicate quadrant change. It goes a step further with a built-in timer that gradually increases the time spent in each quadrant (over a span of 90 days) till the sounds indicate 30-second intervals. The sonic technology in the Philips Sonicare minimizes the brush strokes to 500 strokes per minute to ease your child into a healthy brushing habit. This model also comes with a downloadable app to educate and excite kids about brushing their teeth. Bluetooth connectivity ensures that you are able to sync the toothbrush to your smartphone and can track your child’s progress. Kids can also earn points as goal setting for sparkly and well-maintained teeth. The Philips Sonicare comes with 6 – 8 interchangeable stickers so your kids can customize their toothbrush as they grow older. This model has exceptionally long battery life and can last almost 3 weeks on a single charge. The Oral B Pro 3 3000 is a low range electronic toothbrush that helps in 100% plaque removal in comparison to manual toothbrushes. With a pressure sensor that alerts you to excess pressure applied, this toothbrush also has an in-handle timer that pulses every 30 seconds to indicate that it’s time to move to the next quadrant of your teeth. Gentle on the gums, it has a circumferential action on the surface of your teeth to give a maximum clean feel. The Oral B Pro 3 3000 does not require additional pressure since it manages the cleanliness of your teeth and gums while you only move the brush around the 4 quadrants of your mouth. This electric toothbrush is powered by Braun and has a recharge life of almost 2 weeks after a single full charge of 24 hours. It comes with 2 toothbrush heads and prompts the emergence of whiter, healthier teeth. Additionally, this model is compatible with the following replaceable toothbrush heads: 3D white, dual clean, power tip, ortho care, sensitive clean, and floss action, precision clean, cross action, tri zone, and sensi ultrathin. 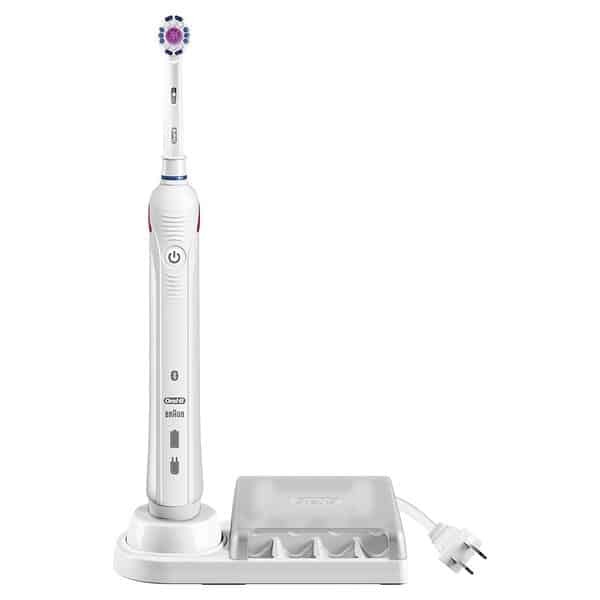 The Oral B Smart 6 6000 is a mid-range toothbrush powered by Braun for flawless results. With 5 brushing modes to choose from (Daily Clean, Sensitive, Whitening, Gum Care, and Whitening), this electronic toothbrush is perfect for people keen on excellent oral health and hygiene. It controls the pressure and brush speed if too much pressure is applied while you brush. You can receive focused and personalized dental care journeys in order to meet your oral goals and needs. The Oral B Smart 6 6000 also comes with Bluetooth connectivity to your smartphone so you can track your progress real time and it also alerts you to any quadrants you might have missed while you brush. 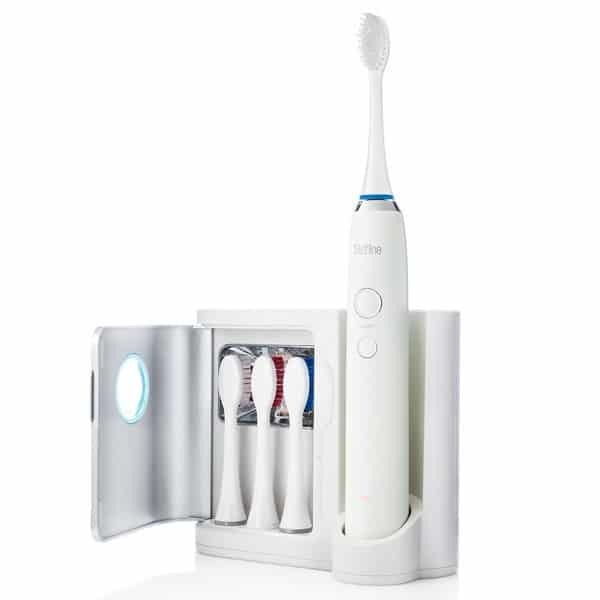 With 4 replaceable brush heads, a premium travel case, and a refill holder for the charger, this toothbrush also has a 3D cleaning effect to oscillate, pulsate, and rotate. This model has 3 complimentary brush heads so you don’t have to buy them separately immediately. 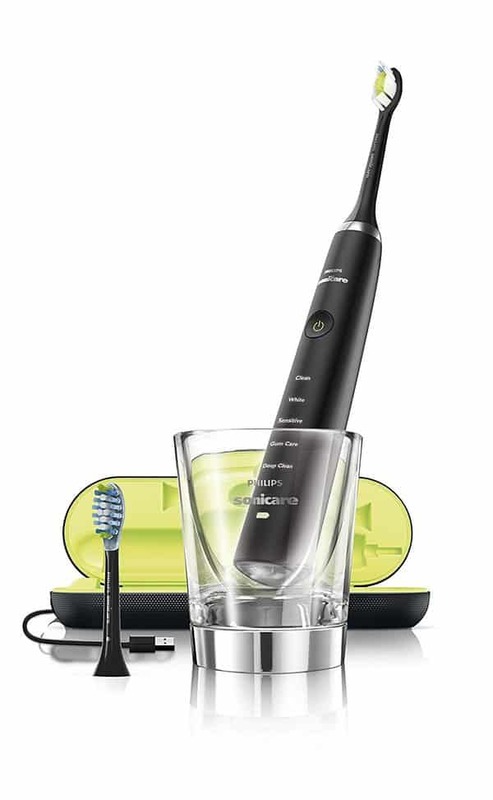 The Philips Sonicare Diamond Clean is a mid-range electronic toothbrush recommended by many dental professionals. 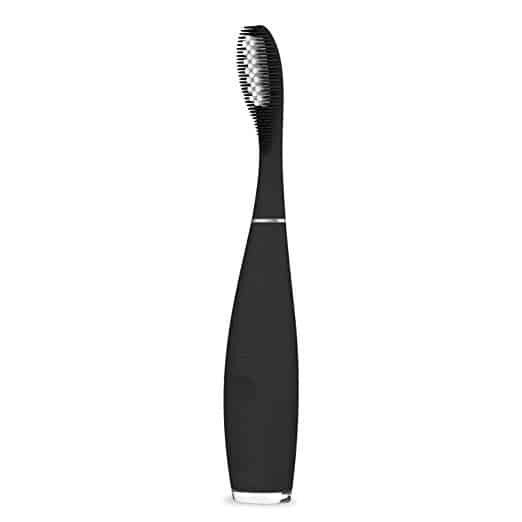 Stylish in design and matte black, this toothbrush has LED lights that glow and fade to give the look and feel of a sleek and minimalist model. The Diamond Clean is known for its stellar clean feel. The new AdaptiveClean feature removes 10 times more plaque than a normal manual toothbrush and assists in bad breath control. It also promotes healthier gums with a proven record of 2 weeks. The brush head design enables four times more surface contact. This model has 5 cleaning modes – Deep Clean, Sensitive, White, Gum Care, and Clean. With a 2-minute timer to automatically track brushing time, it also comes with a 20 seconds interval timer. The Philips Diamond Clean model is known for enhancing teeth to shine and become whiter within a week. The only thing missing is this model is a pressure sensor. Apart from this drawback, the Diamond Clean is a fantastic model that promotes gum health and oral hygiene. The Colgate A1500 ProClinical is a mid-range electric toothbrush that removes plaque 5 times faster than a manual toothbrush. It comes with specially designed soft bristled brush heads that are gentle but effective on gums. Smart sensors are inbuilt to control speed and cleaning action for brushing along the gum line and teeth. You can also choose the cleaning mode for a more comfortable clean experience. The Colgate A1500 ProClinical comes with a beautiful travel case and a charging base to store two brush heads. It also comes with one additional brush head for sensitive teeth and two triple clean brush heads. This model is also charged by Omron and is known to polish and promote interdental cleanliness. This model does not come with a pressure sensor but has a 2-minute timer with a 30-second pacer for quadrant cleaning action. 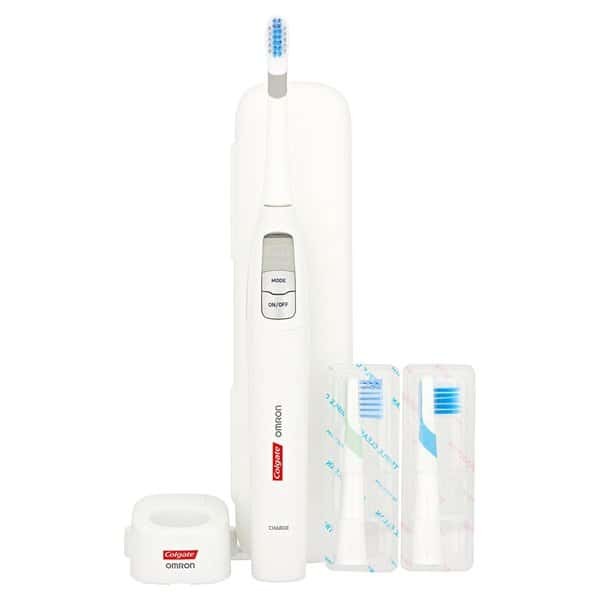 The Panasonic Sonic Vibration EW-DE92 is a high-range toothbrush with 31,000 brushstrokes per minute that provides an extremely comfortable yet clean feel. It has four mode settings for people who like to take their time cleaning their teeth and gums to perfection. These modes are Gum Care, Soft, Sensitive, and White. This model comes with three different types of brush heads – precision point brush to reach in the hard-to-access places between teeth, rotating-oscillating triple-edge brush to remove plaque and stains, and a newer looking Ionic two-way silicone brush for gum care. The Panasonic Sonic Vibration is known for its 6-hour charge that lasts for almost a month. It also has a sleek travel case with slots for the brush head and handle and weighs approximately 300 grams making it a lightweight, user-friendly model. 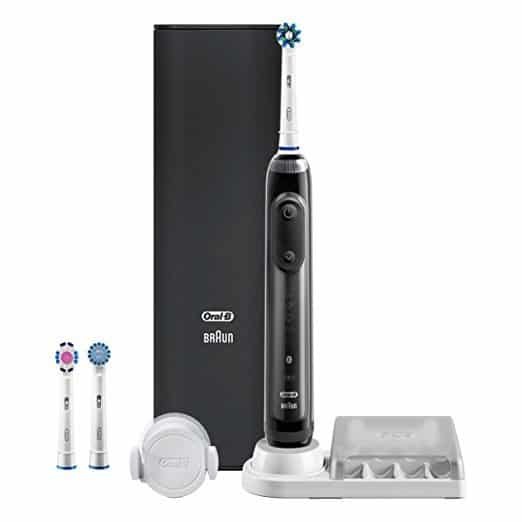 The Swedish engineered Foreo Issa Hybrid is a high-range waterproof toothbrush made with super durable PBT polymer and extremely soft silicone to give an invigorating clean experience. The brush head is a cross-design that is gentle on the gums and hard on plaque and leftover food particles. The soft silicone bristles in the brush head protect the gum line without causing abrasions, tears, or irritation. The silicone and PBT polymer together prevent excess bacteria from remaining on the teeth, gums and around the mouth. The Foreo Issa Hybrid is a durable model that comes with long lasting brush heads that can last 6 – 8 months. Apart from this fantastic feature, it is also lightweight and can be charged anywhere with a portable USB charger. Each one-hour charge can last for almost 360 uses. This is a sleek model available in 4 different colors and does not come with a bulky charging stand. 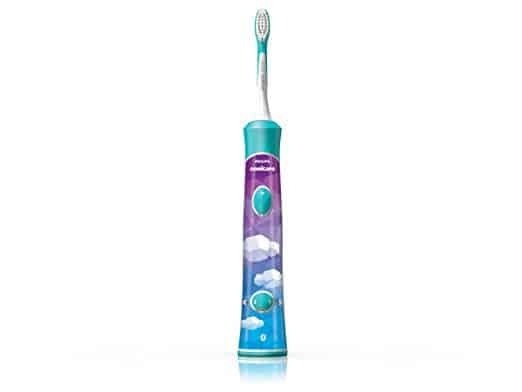 It also has a 2-year warranty, a 10-year quality guarantee, 3D flexible brush head, and 8-speed settings to give you the best oral hygiene possible. The Oral B Genius Pro 8000 is one of the most expensive electric toothbrushes available, but completely worth the price point. The Genius 8000 pairs with your smartphone and helps you find missed spots in your quadrant brushing with position detection through facial recognition. The multicolor SmartRing helps in visual coaching and pressure sensitivity for you to get the best out of your experience. It also automatically slows down the speed of the brush to protect the gums and alerts you to excessive pressure. The Oral B Genius Pro 8000 comes with 6 different modes of brushing – Gum Care, Whitening, Sensitive, Tongue Cleaning, Daily Clean, and Pro-Clean Mode. You can alter the modes based on your requirement. This model also comes with a smart travel case in which you can charge your brush and your phone at the same time. Powered by Braun, this model is one of the best we have seen so far and is compatible with almost all Oral B brush heads for ease of use.